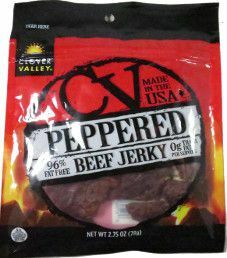 This review will focus on a 2.75 ounce/78 gram bag of beef jerky for the Clover Valley brand name. Worth noting is that the actual jerky weight is only 72 grams, where 79 grams is supposed to be the net weight, which includes the weight of the plastic bag. This bag was purchased at a Dollar General Store in North Arlington, New Jersey in 2015.